University of San Francisco received a A. "The Jesuit University of San Francisco, "one of the premier private universities in California," offers a wealth of excellent degree programs and a demanding core curriculum. The McLaren School of Business consistently ranks as one of the country's top international business schools, and you just can't beat college life in the heart of San Francisco." Describe the type of student who should not attend University of San Francisco and explain why. Those students who wish to graduate early by taking courses at other institution. In addition, those students who really wants to spend their time in its maximum potential during their college years should not attend USF. Describe the type of student who should attend University of San Francisco. Why? What is a typical University of San Francisco student like? Describe the type of person that should attend University of San Francisco. What are the top 3 reasons someone should attend University of San Francisco? What was a typical University of San Francisco student like in high school? Describe the type of person that should attend University of San Francisco. A person that isn't afraid of a challenge and frequently had conversations with teachers because at USF there is an expectation of high quality along with interactions between students and professors. If you fit well in the USF community, you'll be welcome. San Francisco's first university, USF was established in October 1855 by a small group of Jesuit priests. 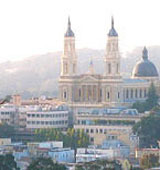 Our founder, Father Anthony Maraschi, S.J., arrived in San Francisco as an Italian immigrant in 1854. The next year, he borrowed $11,500 to build a Jesuit church and school on a few sand dunes on the south side of Market Street (between Fourth and Fifth Streets), and proclaimed, "Here, in time, will be the heart of a great city. The original college, known first as St. Ignatius Academy, was located in a simple frame building 75 feet long by 35 feet wide, now the site of San Francisco Centre. When the school opened its doors to its first class, three students showed up - that number grew to 65 by 1858. The state of California granted it a charter in 1859. In 1862, a new building for the College was constructed on the same site. In June 1863, the first Bachelor of Arts degree was conferred. In 1880, the College moved to new buildings on Van Ness Avenue near the site of the Civic Center (currently the site of the Louise M. Davies Symphony Hall). After the 1906 San Francisco earthquake the College was relocated to temporary quarters at Hayes and Shrader Streets within the year. What are the top 3 things that students do for fun at University of San Francisco? Do you have interior design major? The average student pays $32,369 for tuition, fees, and other expenses, after grants and scholarships. Total stated tuition is $39,840, in-state and on-campus, before financial aid. Learn more about financial aid at http://www.usfca.edu/financialaid/apply/. Estimate the net price for you at http://www.usfca.edu/netpricecalculator/. The typical (median) early career salary of University of San Francisco graduates is $50,100, according to Payscale. University of San Francisco participates in the NCAA Division I-AAA for college athletics. Want more info about University of San Francisco? Get free advice from education experts and Noodle community members. At USF, are Biology and Biochemistry undergraduate research opportunities readily available? What hospital partnerships exist in the University of San Francisco nursing program? How often do students work, volunteer and observe in those hospitals?